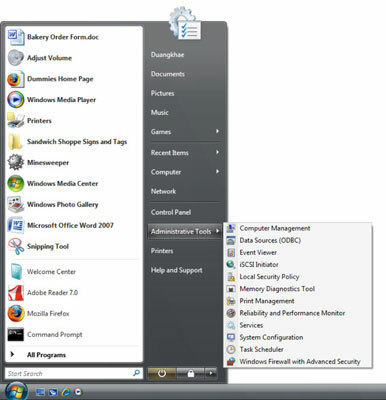 Windows Vista gives you the option to turn ten of the Start menu items into cascading fly-out menus: the User link, Documents, Pictures, Music, Games, Favorites, Recent Items (which can only appear as a fly-out menu), Computer, Control Panel, and Administrative Tools. 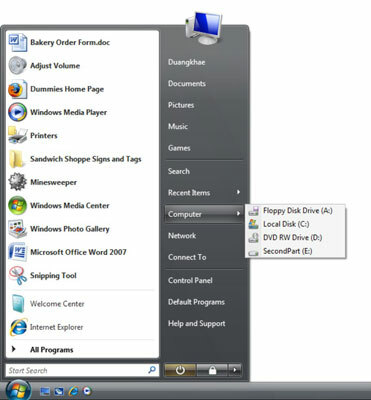 For example, in the following figure, the Computer menu item has been turned into fly-out menu, so the drives on the system appear as clickable entries. Fly-out menus can make selecting items faster. As the following figure shows, the default Start menu is pretty long. Some of this stuff is useless to the average user. Right-click Start and choose Properties. You see the Customize Start Menu dialog box. This one dialog box controls the entire right side of the Start menu. Make whatever choices you like. Choosing not to display something doesn’t delete anything, so you don’t have to worry about losing something you might need later. If there’s a folder or link here that you haven’t ever used, leave it off the Start menu if you can. You can always come back here if you change your mind. A Start menu with all the marketing garbage gone. User: This is where Internet Explorer stores its downloads, so a menu gives you quick access. Documents: Link, only because a fly-out looks like War and Peace. Pictures: Link, because you can’t see the pictures in a flyout menu. Music: Link. But if you always get at your music from the Media Player or Media Center, you can turn this entry off. Games: This is good as a flyout menu. Favorites: Up to you, if you actually use it. 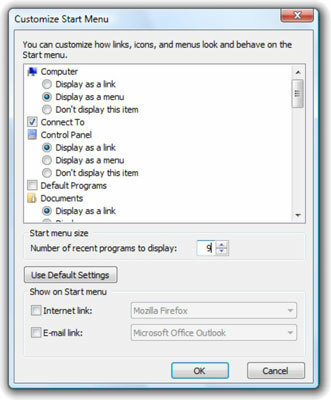 Since Web sites can be pinned to the left side of the Start menu or accessed easily through browser bookmarks, you can save space by just leaving this option off the Start menu. Recent Items: Can only appear as a flyout menu. Computer: Gives you quick access to different drives as a flyout menu. Control Panel: Keep it as a link — the menu’s way too long. 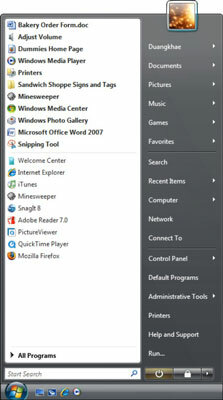 Administrative Tools: Pin any tools you use often to the left side of the Start menu. Otherwise, keep this as a flyout menu. Unfortunately, you can’t click and drag anything onto the right side of the Start menu. It’d sure be nice if you could put the Public folder directly underneath Documents, for example, but you can’t. Don’t waste your time trying to find the correct magical incantation. However, you can click and drag any item from the right side of the Start menu onto the pinned list on the left.